Alumni Ventures Group creates and manages venture capital funds for alumni of top schools and for investors adding to their current venture portfolio with one of our Focused Funds. 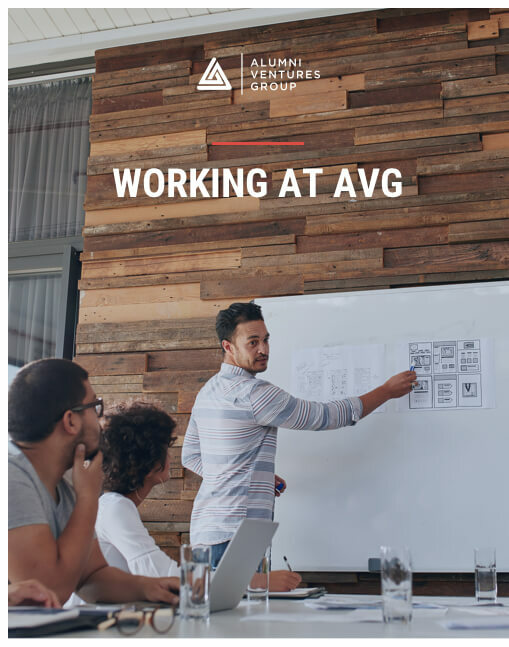 Fueled by a disruptive business model and an innovative solution for an underserved market, AVG is growing rapidly. We’re looking for talented deal team members and support staff who are excited about changing the way people think about venture capital. In return, we offer a generous salary and benefits package, plus a supportive work environment and career growth opportunities alongside a team of talented, motivated performers. We provide the smartest, simplest way for accredited investors to invest in hard-to-access asset classes such as venture capital. We are a diverse, hardworking, and entrepreneurial team of investment professionals who are quantitative, fact-based, and process-oriented decision makers. We are self-aware, curious learners, continuously improving in our service to customers, shareholders, and teammates. You can also check out our opportunities for young professionals interested in getting involved in VC through our Fellow Program or our paid internship openings for undergrads and grads seeking entrepreneurial experience. All of these opportunities are available below through our job board.